The house is cavernous. Built at a time when the largest theatre in Italy was something to crow over, it is now as viable as a sandal maker for Mastodons. Location is everything; if it didn’t occupy the centre piece end of the green wooded square facing the railway station, it could be quietly let out cut-price to IKEA. Closed five years ago after an operational error had spread a nasty batch of asbestos powder through the entire ventilation system, it may soon be nearing a partially functional level. Problem however, is what to fill it with: who of the locals have the vision, media pull and international contact network to be able to pack the building with significant reasons to climb out of your favorite sofa? The framed stars of yesteryear that tradition decrees must smile at you from the stairwells are no longer such pleasant company – the current generation of their replacements certainly don’t shine as convincingly. The two – three most grand spaces have an architecture that takes the breath away. The main foyer stretches long and rises high. Looking down on it, are at least one elegant mezzanine gallery. The backstage of the main theatre with a fly space 26m high is as inspiring as any cathedral. Its massive wooden floor is an unknown commodity in the modern age. Both these spaces should be considered common property of the populous. Beautiful operations could be performed there. If three hundred people a day get to stand stage front and centre, everyone in the city can experience this once a year. Rationalise this down to thirty people, and each citizen gets several photo ops in a lifetime. As a monument to the transcendental powers of cooperative effort that theatre personifies, the house cries out for intense human activity. In the meantime the building has been hit with yet another sort of bomb. Off-limits while work teams remove its immediate chemical toxicity, the city itself went through the embarrassing honour of being Italy’s first municipality to be rendered legally bankrupt. Funds acquired to refurbish its innards in the direction of past glory may just pull it back to square one, but at this juncture, rebuilding even more bigger and better can no longer be a useful operating principle. These twin devastations, economic and environmental, require a unique future oriented response. The city is not alone in this dilemma; if it could generate the consciousness to respond in a smarter, subtle manner it could truly become a monument of international importance. A municipal cultural institution of this size represents some 15-20 salaried and politely pensioned positions in a well-worn hierarchy. This is a lot of patronage, influence peddling and jostling of egos — such schemes rarely generate world-shaking art. The soonish to be reopened massive municipal theatre needs a raison d’être; I was witness to two gatherings to test the waters. The first, dry and predictable in an antechamber at the city hall, invited the local self-styled theatre types to air which of their plans could inhabit the building. The second, potentially equally dry and predicable, gave them one more chance; it asked the apposite question: given that local self-styled theatre types only had use for 10-15% of the building’s capacity — what else would you like your actors/audience to experience here? Gotta love that Latin; as meeting prep I had best augment my rudimentary Italian – wondrously, the key unMonastery rallying cry of ‘social cohesion’ translated seamlessly into coesione sociale. The pull to trump past heights is deeply ingrained in the local populous. 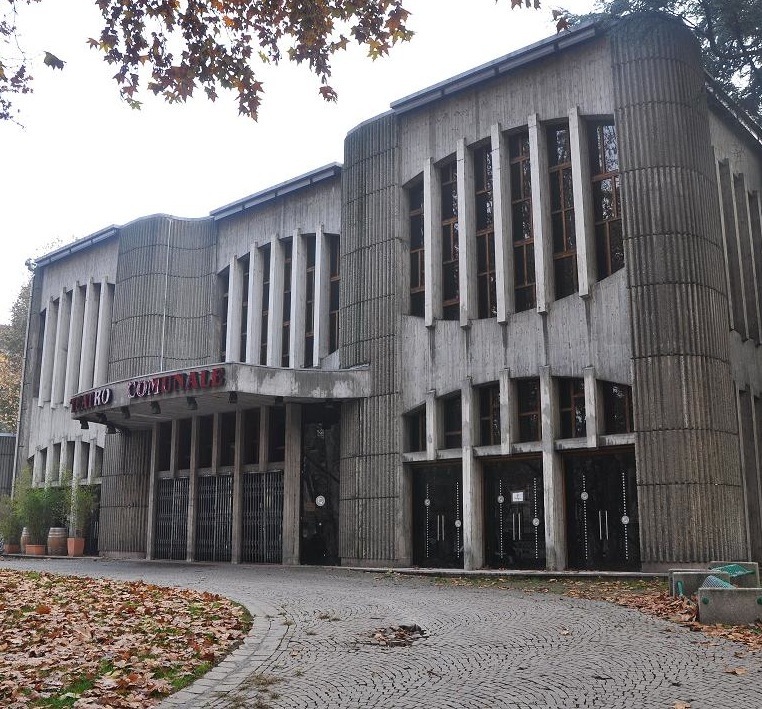 Now, when the modern scourges of asbestos fibres and the downside of deficit financing had besieged the biggest theatre stage in Italy. Voices clamoured for the restoration of past splendor. But could this possibly swing? Designed in the heady days of cheap oil and shaky two-tone television reception, it had served as a convenient stop-over for national tours plying the well-worn circuit across the lucrative North. The fare: charming clunkers featuring stout defenders of the faith. Our meeting was designed to stay low key. Premature visionary design can trigger ingrained nostalgic expectations. The inflated role of imported whiz person could easily generate the usual gang of suspicions: resentment, passivity, intransigence, and a militant ‘wait and see attitude’ that we know only too well. Having budgeted with twenty minutes of at best predictable circular discussion – we would then pull the plug and raise the directed focus of the discussions. 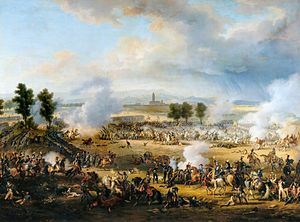 We retreated earlier than planned- thinking we’d better remove the foreigner factor as much as possible, Giorgio would play my earnest straight man in the local dialect. We gathered around the ubiquitous il business model canvas: it did its trick – within less than the allotted time we were heavily bogged down in consultant jargon and spinning out of control. that are of acute importance for a functional society. but the invisible knowledges and clear truths. the miracle of the ensemble and the extreme sport of the collective. — Group breathing, group confrontation, group transcendence. It may not have been diplomatic to describe a beloved institution as a dinosaur, but everyone conceded that this was by no means underestimating the size of the problem. While larger monuments may exist in a few spots around the globe, at issue wasn’t even if there was available nourishment enough to support such an endangered species — refurbishing the same scale drain on the municipal budget in an age where gentlemen ceased to go with Borsalinos* would clearly be an act of fiscal mismanagement. Better a humane assisted death and some inspired use of its skeleton in a manner that includes a larger selection of the audience that the historic opera-goers. The collision would be with the traditionalists. *Alessandria is the ancestral home of this hat-making empire. Expectations can paralyse many a cause. Catering to nostalgia is much easier that feeding people unknowns. Dramatic shifts in focus are often necessary to lift the discussion past the familiar logjams. Adjustment was in order — some familiar words dominated the airwaves of our meeting: teatro and spettacolo were clearly being used as a shorthand. If we continue to say and think teatro – the only imaginable deliverables are dance, concerts, musicals and comic farces. To diffuse this, I interrupted. In trade lingo, we’d always talk of our operation as not ‘the theatre’, but ’the house’ – was this translatable? Yes, in Italian it was also ‘la casa’ . Would this help re-proportion expectations? The strong graphic presence at the foot of the park announces: “Teatro___Comunale” with an unnaturally large space between words. It cries out for vandalismo; over a series of café tables we plotted a tagging design: T-super-C, T-post-C, T-avanti-C were voiced and rejected. My informants, more soaked in the local argot than I, had to be listened to. 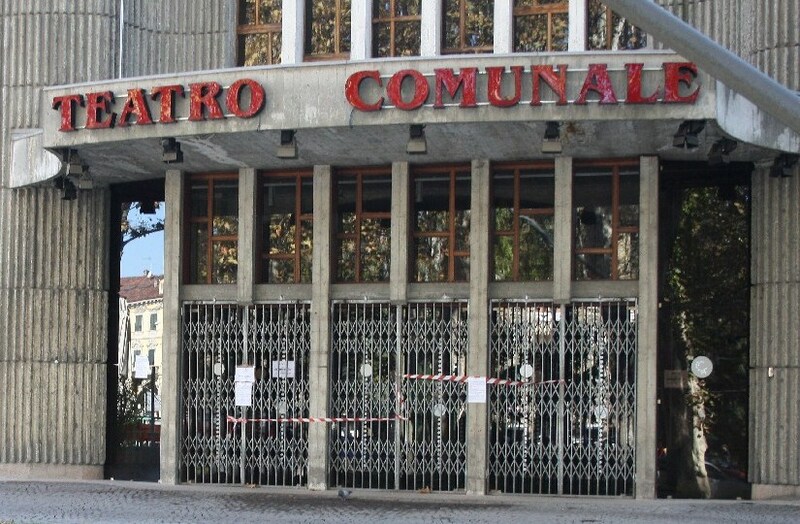 The current favorite, that definitely needs go before a marketing poll, simply hacks two letters out of the second word making something close to Community become Common — Teatro Comune. No longer the municipal showcase, it becomes of the people. The building has 2-5 architectural spaces that can give in the citizenry an inspiring experience of being/doing together. However the largest main spectator space , originally designed looking backwards at fallen glory, is of such proportion to dwarf any realistic use for more than 20 evenings a year (seats 1200). The auditorium is clearly the most costly renovation project – it is also the space most hit by pollutants. It should be possible to practically and symbolically to seal this space (for possible future use) as a monument to false delusions of grandeur. The artistic loss would be frankly small; the savings substantial. It can still be viewed via the solid glass window of the lighting booth. Backstage is a truly magic room that has previously been off limits to all but a handful of stage technicians and performers. Sadly, it is likely that its full height and technically capacity has never been fully explored. Behind the fire curtain an enormous wooden floor with a 26m high ceiling. It itself is an inspiring, flexible space with moderate restoration expenses. With the height and acoustic properties of a cathedral it is suited for public rituals, arena theatre, concerts, dance evenings, a specialised genre of giant puppet theatre, an aerial ballet troupe and other cultural practices yet to be devised. Every citizen should at some juncture in their life have the opportunity to feel themselves the subject of this splendid room. Foyer – a magnificent three story space with a glass front that lets the park in; it is currently divided by a front of house monstrosity used to keep people out! As a first visible, public step – the ticket desk, display walls and assembled equipment now gathered here should be given to an international sculpture symposium to mark the reclaiming of the house. Material gets recycled into sculpture that enriches the park. The foyer and several of the mezzanine balconies can form a major communicative hub for the house functions and a smoke free area for choirs, tango club, stunt poetry readings, yoga classes, an aviary, a hands on permaculture clinic, bridge club, etc. Would the citizens trust the civic assurances that the internal climate of the building was finally free of the toxicity of the past? The very next evening, at the FabLab Arduino Centre in Torino – I came across an exhibit of ELiSE – environment live sensing, a technological sensor for air purity. If we can arrange a marriage of this technology to the house, it could provide both a dynamic survey of air quality and provide an app by which users can use to monitor local conditions; their anxiety can be assuaged while the house’s cutting edge tech savvy gets a strong symbolic example. Ensemble of Social Cohesion Workers – What if the building were run in a monastic like structure as a community of caretakers whose major job is to support preventative health services with an ensemble of ‘social cohesion’ workers? As I recall, the actor’s dressing rooms are far too underground to be healthy monks‘ cells — could full spectrum lighting, piped birdsong, and water-based negative ion generators provide a conducive atmosphere? unMonastery could form/train the host crew of house caretakers. Before closing five years ago, two cleaners took charge of the entire house — unMonasterians (perhaps living on site) do not receive/use conventional economic resources to such a degree; for a lower cost a five-six people team could perform the tasks of cleaning crew and ritual leaders, house hosts, café workers.